Liguria is a narrow land squeezed between the mountains and the sea with mild climate, breathtaking views, spectacular cliffs, small fishing villages with tall and slender houses in vivacious colours, secluded bays and hidden art treasures. This is the perfect place to live the Italian “dolce vita” and immerse yourself in its traditions and cooking courses, taste extraordinary cuisine and meet real locals. Genoa is the perfect entry point from which you can visit the beautiful Italian Riviera. An Italian medieval town where you can really breath its authenticity. This city with its Europe’s largest historical center protected by UNESCO does not bend to become a tourist resort. The Italian Riviera extends in one direction from France to Genoa along the “Riviera di Ponente” which is home to small untouched and precious villages that are part of “The Most Beautiful Villages in Italy” list. Each town has a story and local people ready to tell it. Wine and oil is the quintessence of this part of Liguria. Undiscovered towns and sea resort with something magical that will touch your heart! Up to the Tuscany Border there’s the “Riviera di Levante”, home to the stunning and colored villages of Cinque Terre and Portofino, but also to places you have never known and that have an authentic appeal such as Camogli, Lerici, Tellaro, Sarzana, just to name a few! 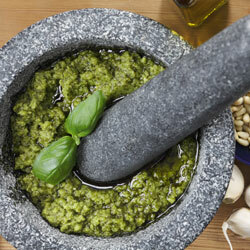 Liguria is famous for seafood, pesto and it’s crisp wines. 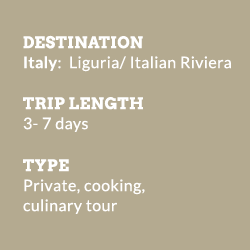 Our suggested itinerary is based on 3 nights/ 4 days and can be entirely tailor-made according to your preferences. It is a food experience in its own right or can be added on to an extended itinerary. Airfare to and from Italy, alcoholic beverages and meals not specified. Fly directly to Geonoa, Milano or Pisa. We will be happy to assist with local transfers. “Thank you so much for a once in a lifetime experience. I so want to move there now”.